Late morning, enjoy a great gastronomy experience. 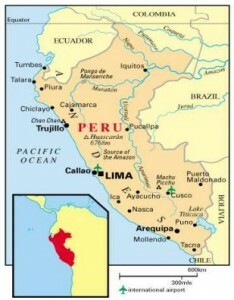 Peru is now widely regarded as one of the world’s leading food and culinary travel destinations. It is home to colorful dishes inspired by the country’s dramatically diverse geography, rich ethnic make-up and long culinary history. Today, you will sample and savor some of the flavors that have helped put Peru on the world food map. You visit a local market, some traditional bodegas and artisan eateries that collectively showcase some of the best of Peru’s produce. Discover new ingredients and learn more about Lima’s trailblazing gastronomic status. Begin at a lively, local market brimming with ingredients that are core to Peruvian cuisine, including fish, crucial to the classic Peruvian Ceviche; one of the 3,000 varieties of Peruvian humble potatoes; and Andean “super foods” like cañihua, sacha inchi, maca and kiwicha. We will also introduce you to native fruits such as chirimoya, mamey, and camu camu. We can pretty much promise you will come across things you have never seen before! Pause for a Peruvian coffee break at a local food-haunt such as La Preferida. This particular bodega is located in a quiet residential neighborhood and popular amongst locals for its wide variety of Peruvian classics, which you can sample at the bar, such as mini causitas, olive octopus, balsamic clams, mixed ceviche and mussels to the chalaca served tapas-style. Today, you begin your trek! You are picked up from your hotel at 8:00 am for the trip to Chonta. Along the way, stop to explore one of two archaeological sites: Kuillarumiyoc or Tarahuasi. These sites were important ritual sites during the height of the Inca Empire, and still hold important significance in Quechua society today. Travel through the landscapes of Limatambo Valley. You spot small farming communities along the way. On reaching Chonta, set out on about an hour’s walk along a narrow track with spectacular views of the Apurimac Canyon. You are almost certain to have the trail to yourselves, as most people visit in the area later in the afternoon. At the viewing point, relax and observe the giant condors soaring over the canyon, while you enjoy a prepared box lunch. After lunch, continue to Pincopata Ecocamp. After breakfast, hike down the valley as far as Totora. Part of the hike will be along a country road before crossing the Santa Teresa River. Hike along the left side of the valley, which will take you through the cloud forest with plenty of opportunities to see unique birds and orchid species. Arriving at Huiñaypocco, your transport will be waiting to drive you to Cafe Ecocamp for a special lunch to celebrate your successful trek. After breakfast, you choose from three options for the morning´s activities, depending on your interests. You can select a hike along an Incan trail to the Llactapata Pass at 2,865 m/ 9,400 ft, before descending down to Llaqtapata. This site offers impressive views of Machu Picchu across the river valley. Stop here for lunch before continuing to the bottom of the Aobamba River Valley. Or, you can opt for a drive through Santa Teresa Valley amid verdant plantations of coffee, bananas and other tropical fruits to the Zipline Park. Experts will be waiting to “show you the ropes.” Following a safety talk and instructions, you are ready to soar like the condors across the Sacsara River Valley. Then have lunch. The third option is a bit more relaxing. Drive to the Cocalmayo Hot Springs, just outside the small town of Santa Teresa where clear, steaming water flows out of the rock into the Urubamba River. Relax in these thermal pools. After breakfast, your local guide will accompany you on the bus to the Machu Picchu archaeological site. After checking in at the park entrance, you and your guide will relish a full-day tour of these unique Inca ruins. Uncover the mysteries of the sacred Lost City of Machu Picchu during an in-depth walking tour. Land price, per person, double occupancy: From US$700 per person per day.